Braces are not just for kids! At Angle Orthodontics, we treat all age groups because teeth can be straightened at any age and a new smile can last a lifetime. It is never too late to seek the benefits of orthodontic care. Although a nice smile is important, improving the health of your gums and teeth is equally important. Crooked teeth and a bad bite may contribute to tooth decay, gum disease, tooth loss, abnormal wear of tooth surfaces, broken teeth, inefficient chewing, excessive stress on the bone that supports the teeth, and misalignment of the jaw joints. These problems can result in chronic headaches or pain in the face or neck. With Dr. Angle’s exceptional training at the Mayo Clinic, she uses all the latest techniques which greatly reduce the discomfort level, decrease the frequency of visits, shortens the treatment time, and may allow you to choose from many options. Dr. 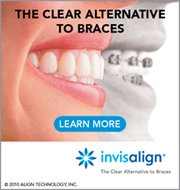 Angle offers the traditional metal braces with the colored ties, ceramic/clear braces, and she is a preferred provider for Invisalign, which are the invisible braces that are removable. These are all great options for adults to straighten their teeth. With a simple complimentary exam, Dr. Angle will be able to determine if you could benefit from orthodontic treatment, what would be involved, the length of treatment, and the approximate cost, including any insurance benefits you may have. It’s not unusual for Angle Orthodontics to be treating an entire family, sometimes one after the other and sometimes the whole family at the same time. Once parents see the beautiful results and the boost in self-esteem from their children after braces are off, they become excited about starting treatment for themselves. The value of an attractive smile should not be underestimated. A pleasing appearance is a vital asset to one’s self-confidence. A person’s self-esteem often improves as treatment brings teeth, lips and face into proportion. In this way, orthodontic treatment can benefit social status, career success, as well as improve one’s general attitude toward life. Angle Orthodontics is also sensitive to adults’ busy schedules. We offer day, evening, and Saturday appointments. Orthodontic treatment can be successful at any age, and adults especially appreciate the benefits of a beautiful smile. One of every five patients in orthodontic treatment is over 21. Some adults may have experienced breakdown or loss of their teeth and bone that supports the teeth and may require periodontal treatment before, during and/or after orthodontic treatment. Bone loss can also limit the amount and direction of tooth movement that is advisable. It is important for adult patients to seek quality experienced care who will work with your dentist or periodontist to coordinate your care to achieve a beautiful healthy smile that you deserve.